Don’t neglect your outdoor spaces this Summer. With plenty of garden parties, alfresco dining and evenings snuggled under the stars, you need to make sure your outdoor spaces are illuminated to promote a welcoming and also safe outdoor environment. Litecraft offer a wide selection of outdoor lights from simple outdoor wall lights and garden pedestals to solar stick lights and funky glow furniture. In-keeping with this weeks Weathered Wonders theme, we’re looking at our range of galvanised, stainless steel and grey outdoor wall lights. These days it’s so much easier to recreate a salvage and industrial look for both interiors and exteriors. High-street home ware stores have taken advantage of this popular trend for a few years now, creating replica salvage designs in brushed, hammered and battered finishes, making redecorating easier and faster. Outdoor Wall lights are both a safety and decorative installation. PIR sensor wall lights will trigger movements. Ideal for illuminating your porches for visitors and unwanted intruders. Different styles will give off different angles of light. Modern styles usually feature smaller more focused light whereas traditional designer usually feature a wider shade, offering a wider scope of light. Check where the bulb is positioned within the fitting. Most wall lights are directional, either producing an up-light or down-light effect or in some fittings both. downcast lights are good over porches and patio doors whilst up light fittings will illuminate your walls and fill the exterior of the house. 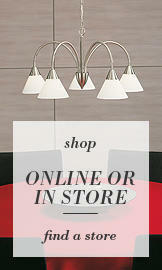 For space saving, consider flushed wall lights as oppose to lantern style wall lights. This style of light will sit flush to the wall. Most flush fittings will resemble a box design. We’ve pulled together our top picks of stainless steel and grey finished outdoor lights to help you when choosing lighting for your outdoor spaces. Scroll down for full product descriptions. 1. Galvanised metal just oozes industrial flare. The term galvanised is simply steel that has had a thin coating of Zinc Oxide poured onto it, a protected skin that prevents erosion and rusting. This style of steel is recognisable from its mottled pattern on the surface of the metal. 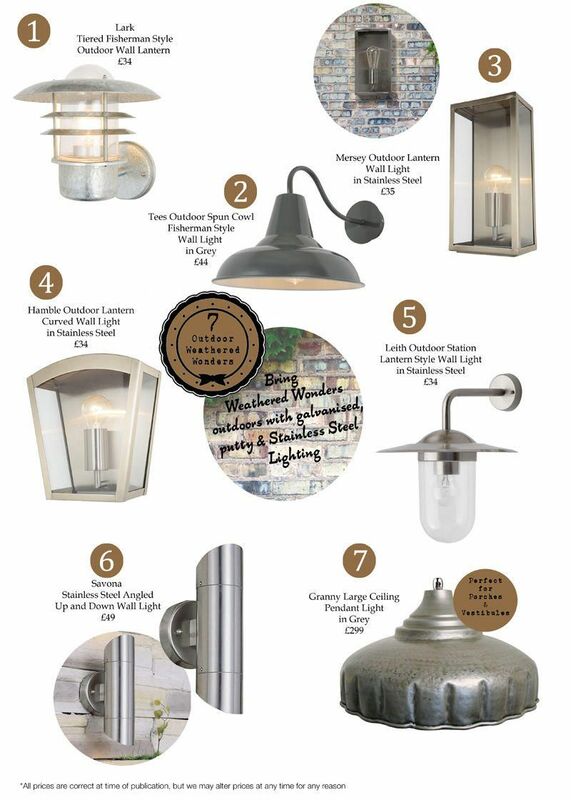 Our Lark Outdoor Wall Lights feature a galvanised metal up-lit design with an acrylic dome shade that houses one bulb. This dome shade allows and up light of illumination whilst the tiered lips cast the light downwards, making this ideal for a full illumination. The design is inspired by authentic fisherman lanterns found around old dock yards and fishing villages. 2. Our Tees Outdoor Wall Lights offer both an industrial and country side style with a simple gloss enamelled shade in an industrial grey tone. Install this downcast lantern above patio and garage doors for a large scope of light. This fitting also comes in a striking black finish or a sweeter soft cream for a more subtle country look. 3. Boxed, encased and caged lighting is bang on trend this year and our Stainless Steel Mersey Outdoor Wall Light is no exception. Featuring a large stainless steel box frame with a clear glass shade exposing the bulb fitting this stunning piece ticks all the industrial trend boxes. Throw a vintage style filament bulb in the mix and your industrial addition is complete. Choose our black option for a more contemporary edge. 4. For a softer style our Hamble Outdoor Wall Lights still boast a boxed design but features a curved edge and a more compact size. The flush style enables for a more space saving illumination, ideal for smaller gardens. Again, we offer this fitting in a striking black finish for a more modern addition. 5. Station inspired lighting gives a nostalgic touch to interiors and exteriors. Usually featuring a bulbous glass or acrylic shade topped with a metal disc top and lip. These fittings would be found in industrial warehouses and stations, place prone to harsh weather conditions. The designs were robust and solid, ideal to withstand such conditions. Our Leith Outdoor Wall Light gives tribute to this inspiring design. Featuring a large bulbous clear shade that exposes the bulb. The fitting is finished off with a stainless steel round lip and sturdy steel arm. 6. Our Savona Angled Outdoor Wall Lights offer a more contemporary design as well as a handy up and down illumination. The stainless steel finish ensures this fitting will withstand corrosion, rust and water stains. The double illumination feature allows for a great spread of light, making this ideal for larger exteriors. Install several fittings midway along your walls to give a guiding light whilst also illuminating the rest of your exteriors. 7. If you’re looking to illuminate your outdoor porches and vestibules with a rustic industrial appeal, our Granny Pendant Ceiling Light is a must. Fit with a vintage filament bulb. This fitting is not advised for outdoor use but can look amazing in porches, conservatories and solariums.